Fall Creek Place is a neighborhood close to Indianapolis’ north side two miles from the middle of the downtown area. This community is operated by the Fall Creek Place Homeowners Association. Because of its community development and excellent planning and design, Fall Creek Place received four national awards and had been featured in magazines as well. It’s easy to feel welcome at Fall Creek Place. Many residents here have known each other for years and are very warm to newcomers. The Fall Creek Place Homeowners Association does everything possible to foster a sense of community. It holds meetings, sets up block parties, and even offers a book club. Trails surrounding this neighborhood include the Fall Creek and Monon Trails. The trails link pedestrians and bike riders to the Indy Greenways, so you can walk or cycle to your heart’s content. There are also four parks nearby for you and your family to play or host a special event. For your shopping and dining needs, you can check out some of the local shops. Goose The Market is where you can grab a snack or pick up a slab of meat. Tea’s Me Cafe offers a variety of teas plus breakfast and lunch. If you desire more shopping options, there’s Castleton Square, a mall about 13 miles away. It’s Indiana’s largest mall, and it has over 130 retailers, many restaurants, and a movie theater. Fall Creek Place has a number of good schools in its vicinity: two charter schools, a magnet school, and a Christian school. If you’re looking for educational options for yourself, Ivy Tech Community College and Marian University are a few minutes away. There are over 400 Fall Creek Place homes. Some of these dwellings possess Victorian styles while others have modern features. These Fall Creek Place real estate properties include apartments, townhouses, and single-family residences with three to six bedrooms and two to three bathrooms. Open plots of land are available for purchase, too. Consider moving your family to Fall Creek Place. 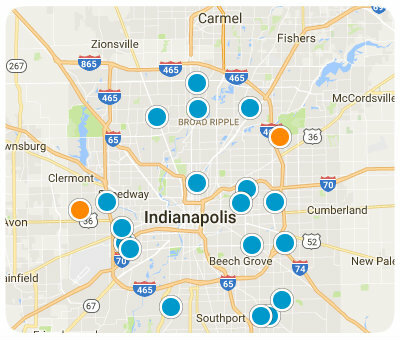 It’s a safe community that’s close to Downtown Indianapolis, plus it’s friendly and puts a great value on neighborhood harmony. If you’re interested in land or homes for sale in Fall Creek Place, Indiana, please don’t hesitate to contact us. Listing courtesy of The Indy Realty Shop. Listing courtesy of Polaris Real Estate Group, Inc. Listing courtesy of Mike Duncan Real Estate Group. Listing courtesy of Dna Properties, Llc. Listing courtesy of Armstrong Real Estate Brokerag. Listing courtesy of Royalty Realty, Llc.